Small-scale, tropical agricultural systems worldwide are often subsistence-oriented, resource-limited, and typically integrate multiple crops and livestock to form complex systems of biological diversity. Underlying these similarities are dynamic interrelationships between humans and the biophysical environment. As dynamic systems, they are subject to perturbation and change. This study of such a system in western Cuba presents a brief synopsis of results from fieldwork conducted for a Master’s thesis in Interdisciplinary Ecology in the Institute of Food and Agricultural Sciences (IFAS) and the School of Natural Resources and Environment (SNRE) at the University of Florida. This work is a collaborative effort among the University of Florida, the University of Havana, Cuba’s Instituto de Investigaciones Fundamentales en Agricultura Tropical (Institute for Fundamental Investigations in Tropical Agriculture or INIFAT), and Vanessa K. Harper. This collaboration was made possible largely through a cooperative agreement established by and between the University of Florida and the University of Havana in 2003. This agreement was established in an effort to promote non-political, academic research and exchange of information. Broadly, this field research describes a livelihood system of small-scale farm households in western Cuba, where a livelihood system is considered to be the composite of all activities available to all households from which to choose to secure their livelihoods. More specifically, the work presents a case study of 15 small-scale farm households in Cuba to identify the specific livelihood strategies that these households select from among those available within the livelihood system. Primary data were collected over the course of a year during two field research trips1 to Cuba. Each of the 15 households was visited, and members of the households were interviewed three to four times for one to four hours each time over the course of that year. Primary methods of data collection included purposive conversations, modified sondeos,2 and semi-structured interviews, botanical and zoological free listing and surveys, and direct observation. Data collection techniques focused on gathering information concerning a number of variables, including land area and tenure, plant and animal diversity, seasonality, resource constraints, factors limiting production, household composition, labor availability, food and cash needs, market integration, and production and reproduction activities.3 These data allow for a holistic understanding of what is done, who does what, when it is done, why it is done, and how it is done. This information serves as the primary foundation of data that can be used to create an Ethnographic Linear Programming (ELP) model. This approach to modeling is based on traditional linear programming and was designed specifically to assist in understanding and examining potential interventions and improvements for diverse rural livelihood systems. It is a useful tool to explore household responses to systemic shocks as well as emerging production technologies and changing policies before such changes are implemented (Hildebrand and Sullivan, 2002; Hildebrand et al., 2003; Hildebrand and Schmink, 2004). The fifteen farm households are located within the Sierra del Rosario Mountains of western Cuba. The Sierra del Rosario constitutes the youngest of two distinct geological areas that comprise the Cordillera de Guaniguanico, which stretches over the whole province of Pinar del Rio. The households are distributed among four communities (La Flora, Rio Hondo, La Tumba, and Los Tumbos) in four municipalities (Candelaria, Bahía Honda, Artemisa, and San Cristobal) within two provinces (Pinar del Rio and Havana). Together, these four municipalities encompass an area of 2609 sq. km and have a total population of 218, 293 (Cuba, 2006). Farmers typically classify their land into five different categories: (1) land occupied by the house and homegarden; (2) arable farmland; (3) pasture; (4) forest; and (5) unusable land. Forested areas are typically intercropped with coffee and fruit trees. These areas can be located in land comprising the house and homegarden, land considered as farm, or both. 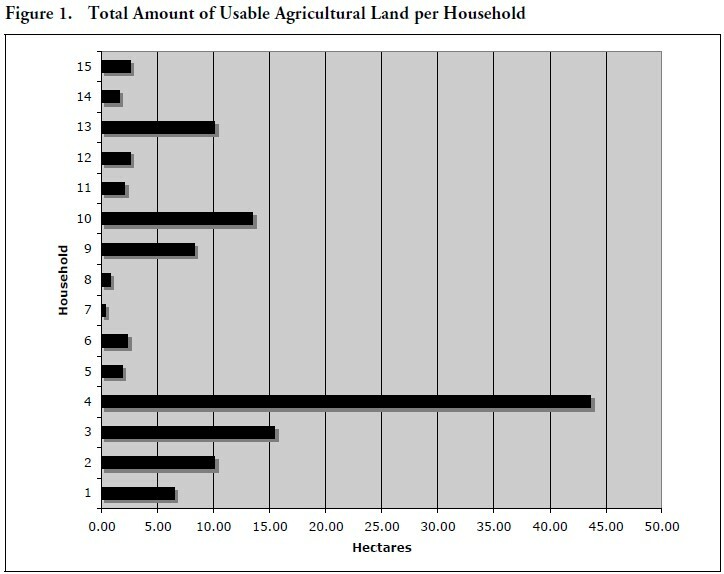 Although total amount of household land of farms in this study ranges from 0.33 to 53.72 ha, the amount of available agricultural land is less for some households (Figure 1). Five of the 15 households have unusable land as part of their total. Farmers either own their land or use land held in usufruct. The Cuban government provides idle land in usufruct to farmers (or potential farmers) on the conditions that they: (1) utilize the land for agricultural production; (2) do not diminish the value of the property; and (3) forsake the land should the government need it for a particular purpose. Forty percent of the fifteen farmers are proprietors of their total land, forty percent hold all their land in usufruct, and twenty percent own part of the land with the additional part belonging to the State. Market Integration These farm households are first, homes and second, businesses and are best characterized as subsistence farm households. Farm-household livelihood strategies are selected for this dual purpose. These households are similar in the sense that they each diversify their livelihood strategies in an effort to meet two primary household goals. The first goal is to produce enough food to meet household consumption requirements. The second goal is to produce enough products to sell for cash income. All 15 households stated that at least 50 percent of their total annual agricultural production is consumed on-farm by either household members or household animals. The amount of agricultural production consumed on the farm ranges from 50–90 percent, with over half of the households selling at least 40 percent of their total annual agricultural production. This shows that the primary purpose of production is for subsistence but also illustrates that each of these households is integrated into the market to some degree. 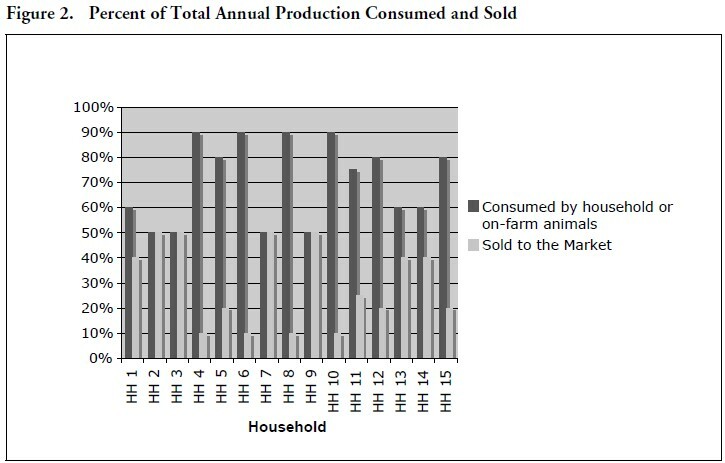 Figure 2 shows the percent of their total annual production that is consumed by household members or on-farm animals and sold to the market to generate cash. For these farm families, when selling to or buying from the market, nothing is simple. Market activities are very complex and time consuming. Figure 3 illustrates how the market is defined within the context of these small-farmer livelihoods, based on interviews with farmers on how they perceive the market. There is both the state sector and a non-state sector. The state sector is comprised of state-run stores and markets. Consumer goods channeled through state agencies (e.g., Acopio) are sold in these stores and markets either in the national currency, the Cuban peso (peso cubano), or the currency used for foreign exchange, the convertible peso (peso convertible). Farmers sell to several government agencies that supply these stores and markets but do not, themselves, sell their excess production individually at these market venues. One exception is farmers who sell excess production at the placitas, but this is often done through cooperatives that have contracted quotas with state agencies. 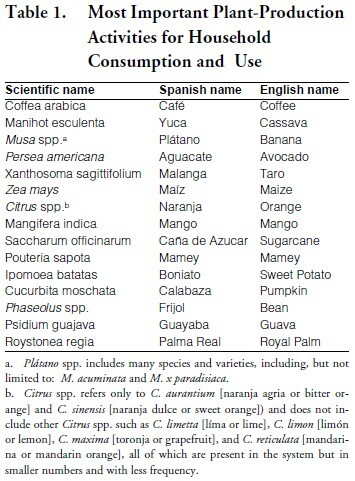 Alvarez (2004) notes that placitas are usually small outlets for the distribution of fruits and vegetables. These outlets are also referred to as puestos. The non-state sector is comprised of both the formal and informal economies. The formal economy consists of the mercados libres agropecuarios (MLAs or free agricultural markets) and the puntos de venta (points of sale) where farmers can legally sell their excess production for prices governed by supply and demand and keep a percentage of the profit.4 The informal economy consists of the underground and black markets, where farmers buy from or sell to other individuals or intermediaries. Products bought and sold on the underground market include consumer goods such as crop production that can be legally sold from the free agricultural markets. In this study, the distinction between the underground and black markets is that those products bought and sold on the black market include consumer goods considered by the government to be illegal to exchange. Illegal products include goods such as cow milk, beef, or chemical inputs such as pesticides. 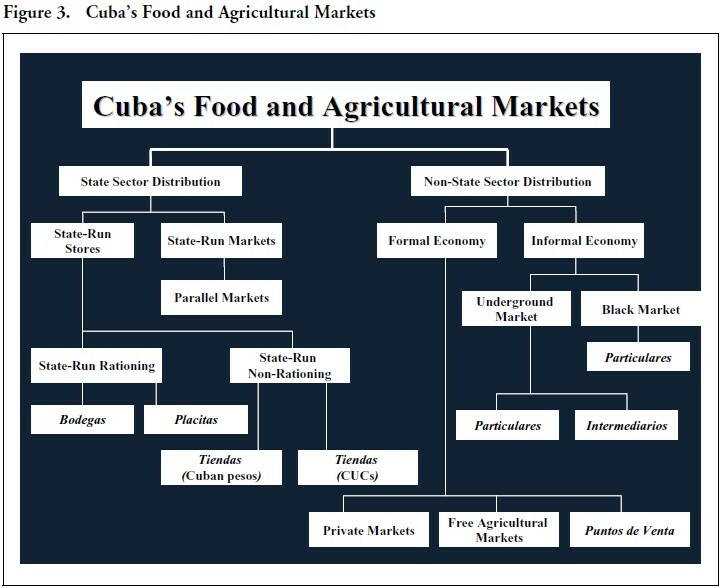 These products are typically scarce and/or are included in the state food rationing system and therefore, the Cuban government seeks to control their production and exchange. Although these households are best characterized as subsistence farm households, not every product can be produced on the farm. Furthermore, the state food rationing system does not provide all of the necessary consumer goods these households need to meet their consumption requirements. Some level of market integration is inevitable. Although state-run stores and markets and the free agricultural markets provide venues from which these goods can be purchased, they are often high priced and/or are not adequately stocked. Selling on and primarily buying from the informal economy is often inevitable and commonplace for all of the households involved in this study. This is simply because, at times, it is the only place where certain needed items can be sold or purchased. 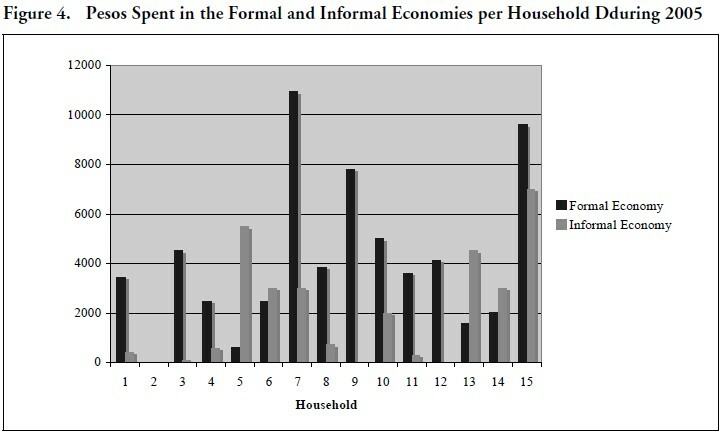 Figure 4 shows the amount of pesos spent in the formal and informal economies per household during the year 2005. All of the households purchased needed consumer goods from the formal economy and well over half purchased goods from the underground and/or black markets.5 Household two was reluctant to discuss market integration in both the formal and informal economies and households nine and 12 did not want to discuss their contact with the informal economy. An important aspect of the livelihood system of these farmers is cooperative membership. Thirteen of the fifteen households surveyed are members of seven different Cooperativas de Crédítos y Servicios (Credit and Service Cooperatives or CCSs). In the CCSs, individuals join together to receive credit and services from state agencies but work their farmland independently and do not share land or profits with other cooperative members. They may, however, share machinery and equipment if these items are available. Participating in this type of cooperative is supposed to provide small farmers with two primary benefits. The first is better access to inputs and state institutional assistance. The second is the provision of an avenue for farmers to sell their agricultural products at fixed prices through state agencies based on production plans and contracts. The CCSs of these farmers, as a whole, make contracts with state agencies based on production quotas for particular agricultural products. These contracts are primarily made with the state food collection and distribution agency, Acopio (or its subsidiaries). This collection and distribution system was established in 1962 and has been the official link between producers and consumers since that time (Alvarez, 2004). Each of the 13 households who participate in a CCS stated that they joined to have better access to tools, inputs, and assistance from state agencies. According to the farmers, these benefits have continued to decrease since the early years of the Special Period in Time of Peace (Special Period).6 Each household also stated that although they maintain contracts with Acopio to ensure some degree of sale of their production, they concurred that Acopio’s prices are incredibly low, that the state agency rarely pays on time, and that material incentives received are relatively nonexistent. All livelihood strategies are either production or reproduction activities. Production activities are those that produce something either for household consumption and use or for sale to the market for the purpose of generating cash. Production activities include: (1) plant-based agricultural activities (e.g., coffee); (2) animal-based activities (e.g., pigs); (3) valuea dded production activities (e.g., cheese); and (4) other activities and income generation (e.g., off-farm work). A total of 65 possible production activities were identified, which comprise the livelihood system that these farmers choose from in order to maintain their livelihoods. Of those 65 activities, 47 include plants that they produce. The fifteen most important7 for household consumption and use by both household members and on-farm animals are listed in Table 1. 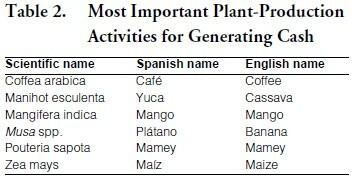 The most important plant-production activities to generate cash are listed in Table 2. Seven activities include animals they produce on farm. The most important animals for household consumption include pigs and chickens and the most important for generating cash are pigs. 4. the production of cheese from cow milk;. 6. the production of tools for household and farm activities. Two other important production activities include the production of milk and the production of construction wood from harvested trees. Some farmers or affiliated household members also generate additional cash either from pensions, remittances, or offfarm work. Some of these activities are more gender specific than others, and largely depend on household composition. Reproduction activities are significant because they often utilize large amounts of time, which is scarce. Household labor is probably one of the most constraining resources given the fact that they do not have access to inputs and/or excess cash to hire off farm labor, both of which could ultimately increase annual production and subsequently, cash income. Post-harvest storage is a concern for any small farmer, as storage facilities for large quantities of products are generally not available. This is one of the primary reasons why these farmers continue to contract their production to state agencies such as Acopio year after year. A lack of storage facilities also justifies to these farmers the need to sell to intermediaries. These intermediaries typically purchase large quantities of production at one time to re-sell at the free agricultural markets or to other intermediaries. Although it is not monetarily beneficial, most households will also give excess production that cannot be consumed or sold as gifts to schools and hospitals. This gift giving, however, does carry with it social recognition often provided by the State in the form of certificates. Data collected suggest that the 15 studied households are adaptable and maintain a high level of resilience via diversified livelihood strategies (both agricultural and non-agriculturally based) but continue to face varying, but chronic, levels of uncertainty and food insecurity. Consequently, diversification of livelihood strategies appears to be a mechanism by which households cope with a restrictive yet dynamic political economy and limited resource access and availability. Household members act as entrepreneurs by perceiving opportunities to engage in profit-making activities and independently organizing, operating, and assuming any associated risk to create products in order to generate needed cash income. This entrepreneurship often enables household members to meet minimum consumption requirements (of both food and non-food consumer goods) for survival, but continues to be constrained in the face of the complexity of Cuba’s political economy, a lack of accessibility to the free agricultural markets, the inconsistency and/or unavailability of critical resources, and environmental factors such as geography and climate. 1. The first research trip lasted approximately three months during the summer of 2005 and the second lasted about two months during the summer of 2006. 2. Hildebrand and Schmink (2004) describe a sondeo as a conversational survey that does not depend on a survey instrument and is interested in information, not responses to pre-determined questions. This technique is inductive rather than statistical and typically involves an interdisciplinary research team. Because an interdisciplinary team is infeasible in this context, a modified sondeo, utilizing one interdisciplinary researcher was used. 3. Reproduction activities are those that contribute to the maintenance of the household and its members. 4. When selling at the MLAs or puntos de venta, these farmers are typically required to give a portion of the products or sale (in pesos cubanos) to the State or their respective cooperative. 5. Because of the sensitivity associated with questions targeting personal economics, information obtained from respondents concerning the informal economy serves only as a general benchmark to illustrate the commonality of interacting with the underground and black markets. 6. The period following the collapse of the Soviet Union and the sudden loss of its support and subsidization to the Cuban economy, which brought about a period of a scarcity and austerity. 7. In this context, most important means that at least half of the 15 households have this production activity as a primary livelihood strategy.